BTC/USD has settled at $5,000 hanlde, consolidation in store. Traditional finance industry is more loyal towards digital currencies. Doji on a weekly chart may transform into an Evening Star. 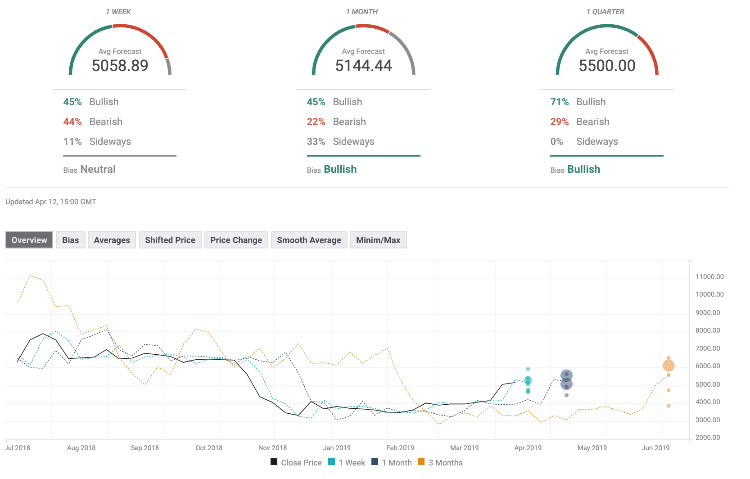 The cryptocurrency market entered a period of consolidation with bearish bias a stellar growth during the previous week. The upside momentum waned out by the middle of the week and turned in the outright correction on Friday. While the sell-off qualifies as a healthy correction, many altcoins are nursing losses when compared to the levels seven days ago. Bitcoin, the largest and the most popular cryptocurrency, managed to gain a pathetic 1.7% on a w/w basis. The trading patterns of the week were dictated mostly by speculative factors and fluid market sentiments, which is nothing new on the cryptocurrency market. However, a couple of fundamental developments might have a profound influence on the industry in the long run. First, we got another confirmation that the global banking system has changed its attitude towards the cryptocurrency industry. Many large banks have been embracing the idea of digital money and even creating their own stablecoins to facilitate internal payments. In the most recent development, the Japanese banking giant and the fifth largest financial institution of the world Mitsubishi UFJ Financial Group (MUFG) has been testing its own JPY-pegged stablecoin. The bank plans to bring it online by the end of the year. Moreover, the CEOs of US largest banks said that they would adopt blockchain and cryptocurrency technologies provided that they are properly controlled and regulated. This is a big step forward considering the damnatory view they expressed a year earlier. In a separate research published by Oracle, blockchain adoption is deemed more like a reality than a distant possibility. The experts of the company found out that companies all over the world are looking into blockchain technologies to optimize their business processes, and at least 50% of all companies around the globe will use blockchain by 2021. Elsewhere, Ethereum Classic emerged as a growth leader this week. despite a correction on Thursday and Friday, the coin has gained nearly 10% in recent seven days, while other altcoins have been nursing losses on a weekly basis. The fundamental factors behind ETC success are numerous. First and foremost, the developers released a major update of the wallet which now supports Ethereum, and discussed an upcoming hardfork that will improve the network capacity and functionality. Apart from that one of the largest cryptocurrency exchanges Poloniex added the coin to its margin trading offering. BTC/USD jumped to $5,468 in the beginning of the week only to collapse to $4,912 on Friday. While the coin has regained ground above $5,000 by the time of writing, the upside momentum is weak, while the long-term picture implies some rangebound trading at best. A doji candle with a long upside shadow after a large green candlestick on a weekly chart with a long on a weekly chart may transform into an Evening Star formation. The pattern is not completed and requires a confirmation in the form of a big bearish candle. However, investors should be on a look out as the situation is very fluid at this stage. The flat weekly Relative Strength Index (RSI) in a neutral zone is consistent with the rangebound scenario. Meanwhile, if the price moves significantly below $4,600 strengthened by DMA200, the correction will transform into a more serious decline with the next focus on $4,200-$4,180 (DMA50) and psychological $4,000. On the upside, we will need to see a sustainable move above $5,300 to mitigate the bearish pressure and motivate Bitcoin bulls. The next target is created by the recent high $5,468, followed by $5,630 with weekly SMA50 located right above this handle. The Forecast Poll of experts improved slightly since the previous week as expectations on midterm and long term timeframes are bullish. All price estimations are above $5,000 handle with an average 1-quarter forecast of $5,500 against $4,950 in the previous week.